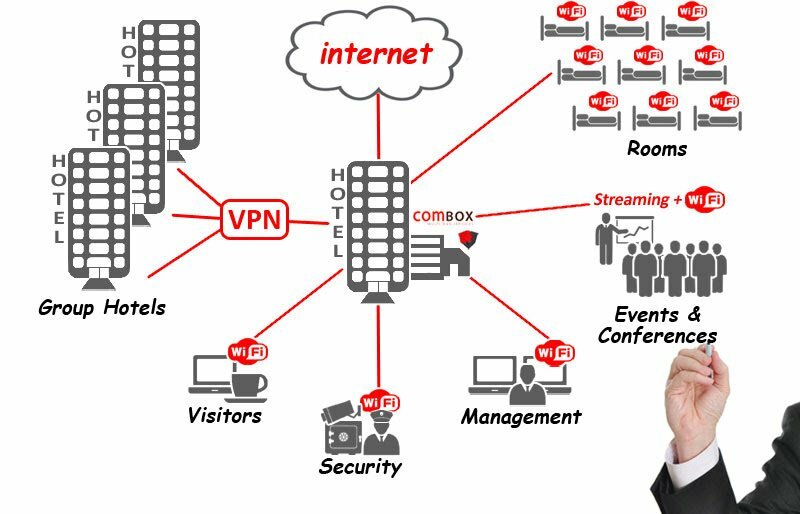 The comBOX Virtual Leased Line service bundles offer the most flexible, efficient, and cost-effective solution for the high Internet needs of your hotel. Is Your Hotel business based in areas with limited Internet connectivity infrastructure? Do You receive complaints from Your visitors regarding slow WiFi Internet access? Is Your Hotel’s Internet connection capable of supporting the high bandwidth demands of conferences and events? Do you need efficient interconnection (VPN) between your Hotel branches? If your business is located outside of metropolitan areas, or even within, but far from the local center of the available providers, therefore with limited and costly options for professional Internet connectivity, comBOX Virtual Leased Line technology will offer you a permanent solution in order to serve both your operational needs, as well as your guests. You can give a boost to your hotel Internet access, taking advantage of the bandwidth bonding and optimization of 2 simple xDSL lines, and as your needs grow you may add as many of these as required. No need to end-up with high-cost and non-flexible services, while you can build your hotel’s Internet infrastructure based on its evolving needs. By choosing the appropriate comBOX Virtual Leased Line service bundle, you will have a single high-speed and reliable Internet connection for your administrative needs, conferences, but also for the high demanding needs of your customers, regarding their Internet connectivity through multiple devices such as smart phones and tablets.